Feral and outdoor cats manage quite well as long as they can find shelter, especially in harsh weather. If you are handy at DIY, you can build a shelter from scratch, but for those less adept, here are some simple ideas for providing inexpensive shelters. 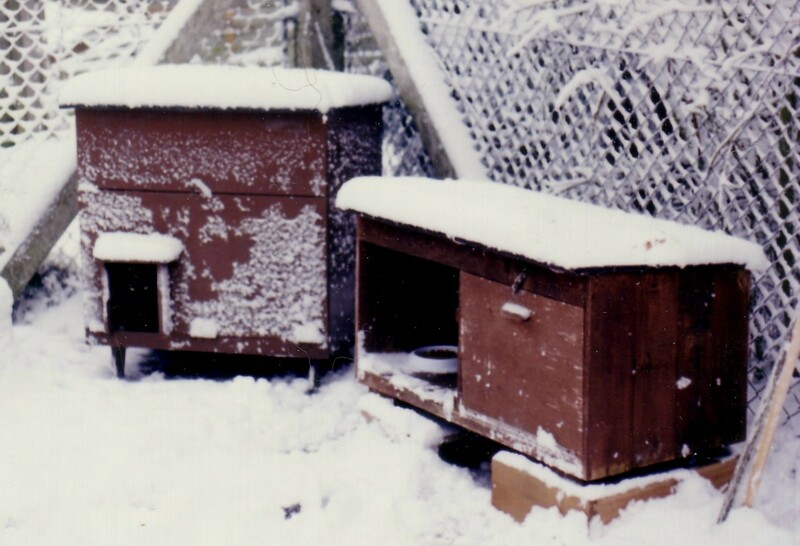 Outdoor cats, such as ferals or working farm cats, need warm, dry shelters, especially in winter. The expanded polystyrene (Styrofoam) containers (“coolers”) mentioned are common in North America, but less so in the UK. If coolers aren’t available in your area, thick sheets of expanded polystyrene could be used instead. I often see large rabbit hutches offered for sale very cheaply at the roadside. The type required is the 2-compartment outdoor type with a roof that slopes downwards at the back. 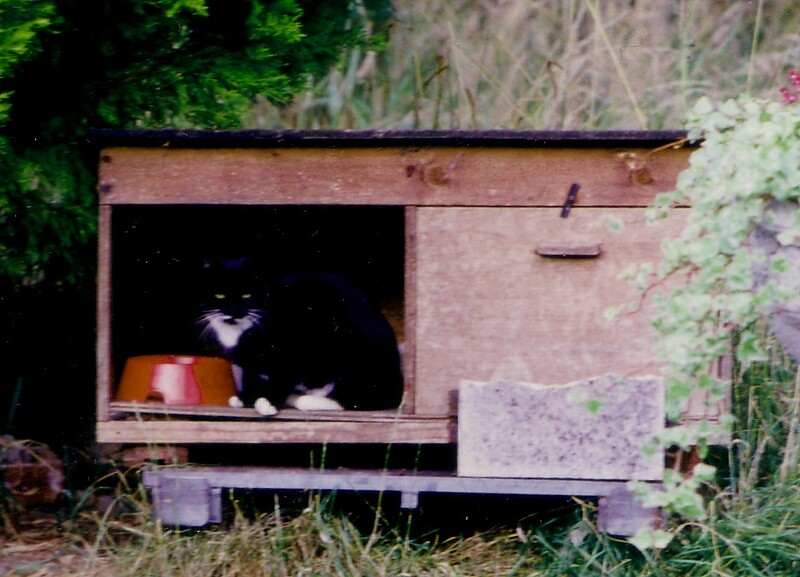 Providing the hutch are sound, it can be made into a winter shelter. Make sure the roof is sound and doesn’t leak. Roofing felt or, at a pinch, a sheet of weighted plastic laid on top can help keep it dry. Replace the mesh-front of the larger compartment with a removable wooden front. This needs to be removable so the hutch can be cleaned when the cat is not in residence. 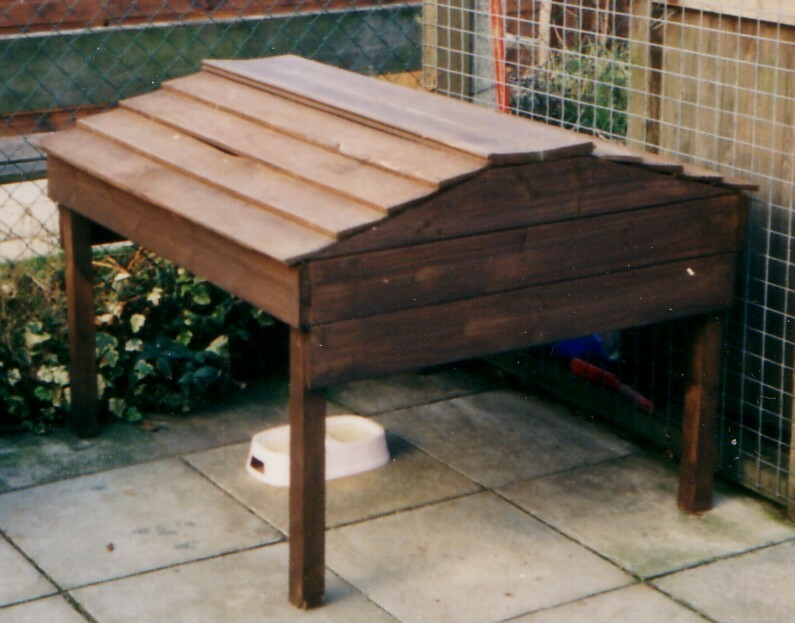 Remove the wooden front of the rabbit sleeping compartment entirely to leave a “porch” area. Most feral cats prefer not to sleep too close to their food, so don’t place bowls in the porch area. The large compartment can be lined with dry hay or old linens to provide warmth. These should be changed regularly to prevent build up of dirt and flea larvae. 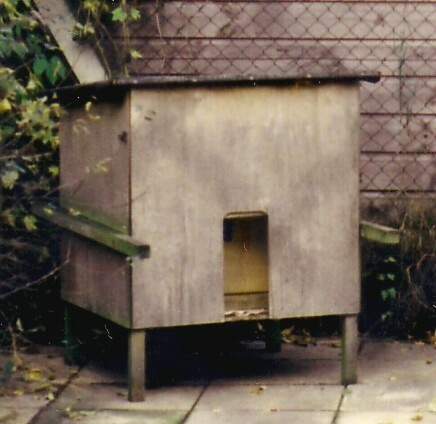 The hutch should be placed raised from the ground (e.g. on bricks or on a pallet) with the entrance hole not facing the prevailing wind. This requires a large capacity plastic storage bin e.g. 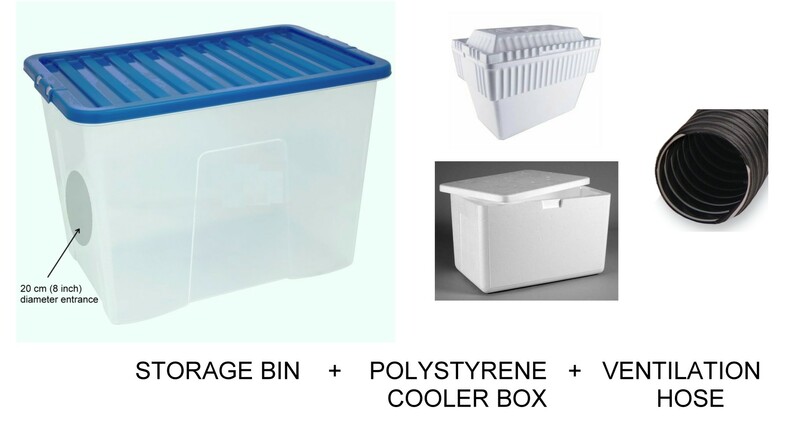 18 US gallon/15 UK gallon/80 litres and an expanded polystyrene (US Styrofoam) container (cooler) that fits neatly inside the storage bin. Cut a 20 cm (8 inch diameter hole) in the front of the storage bin and file away any sharp edges (a plant pot or similar can be used as a guide for drawing the hole). The cat will use this hole for entering and exiting the shelter. Place the expanded polystyrene container inside the storage bin and cut a 20 cm (8 inch diameter hole) in the same place in the polystyrene container. For extra insulation, pack straw into the gap between the polystyrene container and the storage container. Line the inner container with straw to make it comfortable for the cats. Place the lid on the polystyrene container (if it didn’t have a lid, use a second container or a sheet of polystyrene) and tape the edges with duct tape. Fit the lid on the storage bin and tape it shut with duct tape. Insert a short length of circular ventilation duct (the type that looks like an oversized vacuum cleaner flexible hose) through the entry hole(s) to act as a porch and prevent rain from entering. 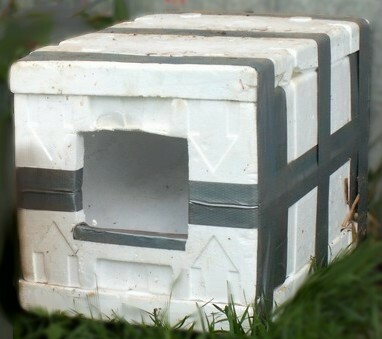 Some feral cats don’t like entering an enclosed box as they feel trapped and vulnerable, so you might need to cut an additional exit hole on the opposite side of the container. For use in windy or exposed areas, you can fit a door-flap of canvas, vinyl or heavy plastic to each entrance of the shelter. Two large polystyrene containers can be duct-taped together and a hole made at one end for the cat to enter and exit and for bedding to be changed. Make sure all the joins are duct-taped to prevent draughts. Wrap a plastic sheet around the shelter to weatherproof it and ensure it is weighted down or pegged down. This sort of shelter is suited to placing in a sheltered location. Two polystyrene (Styrofoam) insulated boxes taped together. For those with basic woodworking skills, it isn’t hard to build a basic wooden shelter. Various feral cat welfare groups have plans, dimensions , materials lists and instructions available. Sloped or apex roof for drainage. Porch or overhang above entrance hole. Hinged door or removable roof so interior can be cleaned. Short legs so base of shelter is raised off the ground (or place it on a pallet). If the shelter is on legs, a ramp will aid access for older cats or kittens. Gloss paint for easy cleaning. 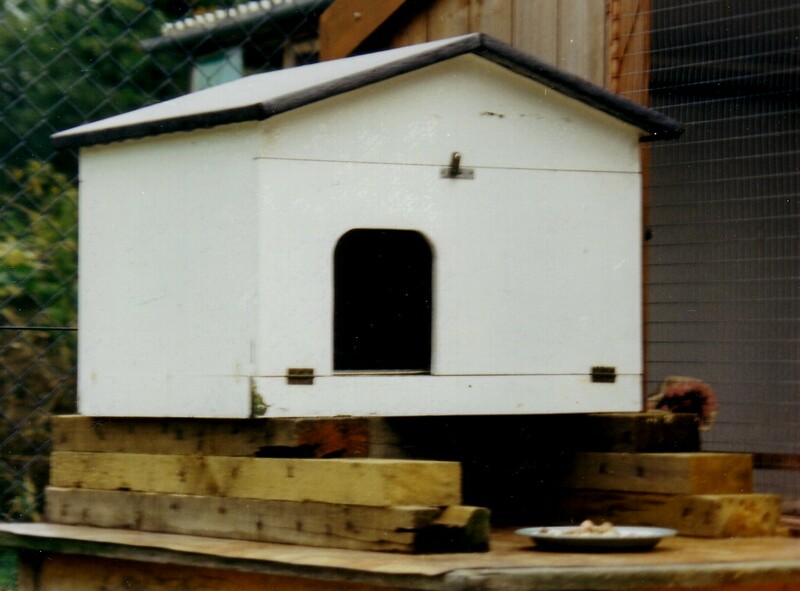 Apex-roof single cat shelter. This shelter has no legs and should be placed on bricks or other supports. A deluxe two-bedroom shelter with shared porch; originally built for a factory cat! The left bedroom has a latched door at the side to allow cleaning. The right bedroom (big enough for 2 cats) has a latched door at the front. Alternatively, the left bedroom can be used as a feeding station for a non-feral outdoor cat. Larger shelters tend to be heavy so you may wish to consider either adding trolley-wheels to the back legs or adding carrying-poles to the side so that it can be moved. The apex-roofed red shelter and sloping-roofed white shelter have trolley wheels at the rear so they can be moved around by one person. The sloping-roofed white shelter has a single support at the front instead of legs. Large enough to accommodate a fleecy cat bed or cardboard box inside. A larger and very sturdy shelter with a removable sloping roof. It has carrying poles fitted and requires 2 people to move it around. It is large enough to accommodate a fleecy bed or cardboard box inside.